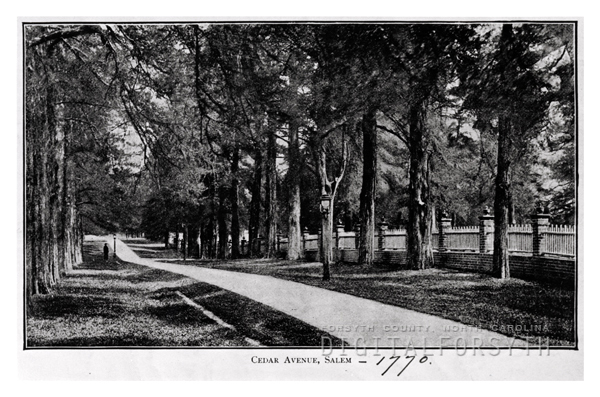 This view of Cedar Avenue in Salem was taken from the south looking north. The God’s Acre fence is seen running along the right side of the walkway. An unidentified person is seen to the left next to a streetlamp pole. The handwritten “1770.” most likely refers to the date that Salem’s God’s Acre was established (more correctly it was established in 1771). This view of Cedar Avenue in Salem was taken from the south looking north. The God's Acre fence is seen running along the right side of the walkway. An unidentified person is seen to the left next to a streetlamp pole. The handwritten "1770." most likely refers to the date that Salem's God's Acre was established (more correctly it was established in 1771).